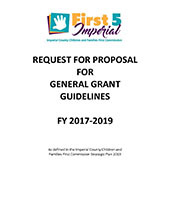 Funding Opportunity Currenly Closed: The Imperial County Children and Families First Commission (First 5 Imperial) has authorized the release of its Request For Proposal (RFP) for General Grant for the 2017-2019 funding cycle. 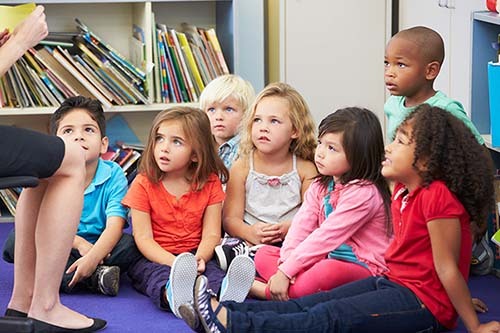 The competitive RFP application process is for organizations interested in submitting proposals that intend to offer services to children 0-5 years of age, their parents and/or caregivers that fall within strategic objectives identified under at least one of the three goals of First 5 Imperial's Strategic Plan. Interested proposers must submit a mandatory Letter of Intent To Apply and the required documents listed in Exhibit I (Documents Checklist) of the RFP for General Grant Guidelines. A total of $1,500,000.00 has been allocated for each year of the two-year cycle, beginning July 1, 2017. The maximum award for individual application is set at $250,000.00.